On May 7, early in the morning, CCTV rather mysteriously broadcast a special documentary about the self-immolations in Tibet, there was a Chinese and an English version. This 41 minute long piece describes the self-immolations from the point of view of China’s official media that serves as the mouthpiece of the local authorities. Right afterwards, some netizen friends wondered: “They broadcast it in the middle of the night… this must mean that they don’t want ordinary Chinese people to watch it”. The next day, CCTV broadcast this programme in French, Spanish, Arabic, Russian etc. on TV channels outside China but since these channels cannot be received inside China, it is basically true that near to no Chinese people actually got to see it. Picture 1 and picture 2 show screenshots from the broadcasting of the English version of this documentary on CCTV’s English channel. Picture 3 shows a screenshot of the Chinese version found on YouTube. The programme was not broadcast on Chinese internet TV either. But after three days, the Chinese and English versions were available on YouTube, albeit without the CCTV logo on the screen; it was thought that CCTV itself was responsible for uploading it onto YouTube but we all know that in China, this platform is blocked. As for the various Chinese video websites, up to now, the documentary cannot be found. This clearly shows that this is a programme specially made for foreign audiences, even the Chinese version is mainly directed at “overseas Chinese”. 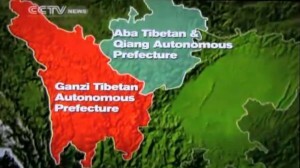 The Tibetologist Elliot Sperling commented: “Tibetan self-immolations have turned into a foreign propaganda battle line”. In view of the ever increasing cases of self-immolations in Tibet since 2009 that are a resolute act of resistance, the Chinese government has had to offer an explanation to the world that is favourable to itself and keeps its own face, which becomes evident from the name of this fact-distorting documentary: “The Dalai Clique and the Self-Immolation Event”. So, why did the authorities decide to, this time, only broadcast the documentary to audiences abroad and not to people within China? Is it only to prevent Han Chinese, the majority of all Chinese people, to learn any more about the current situation in Tibet and risk that they start doubting the claims by the authorities that “Today, Tibetans are experiencing development and happiness as never before in history”? This is probably one reason, but the more important reason is that they are afraid of provoking the several millions of Tibetans living in Tibet and with them also the much-feared Uyghurs and Mongolians. 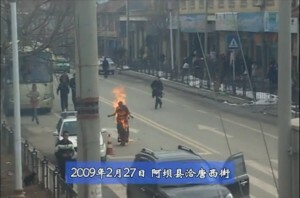 This documentary only talks about 13 Tibetan self-immolators, but some of the video recordings and images shown here are revealed to the public for the very first time and display the great courage of the Tibetan self-immolators; on top of that, the various kinds of explanations offered by CCTV are full of ridiculous loopholes. According to information from Labrang, Amdo, already in early February this year, they started showing a propaganda film called “The Dalai Splittists” which portrays all Tibetan self-immolators as having personality disorders. The local authorities requested all monasteries, villages and schools to send representatives to watch this film and offer a critique; however, most people’s reactions were quite conflicting. In fact, with now 31 cases, Amdo is the place that experienced the most self-immolations. After the film had been shown, 16 people self-immolated in February, 11 in March, 2 in April and another 3 in May, including a Mother of three children. Two of the self-immolations happened in Lhasa on the 6th day of the most important Buddhist festival, “Saga Dawa”. Between the holy Jokhang Temple that is frequented by people from all over Tibet and Barkhor Police Station, a place that takes on the function of oppressing the people, two young Tibetans from Amdo who had been jobbing in Lhasa, self-immolated. The screening of this film in Labrang, Amdo, was probably only a trial screening. And it probably served as a prototype for the CCTV propaganda film because many scenes are very similar. However, as a netizen commented: “I just finished the 40-minute-long English version of the CCTV documentary about Tibetan self-immolations, my feeling is that if one turns off the sound, it immediately comes across as an anti-government news report. What is the point of making such a double-edged propaganda film? !” Obviously, this proves the point that the explanations given are absurd and despicable.